A career retrospective exhibit of the work of internationally-recognized artist Warren Kimble is on view at the Henry Sheldon Museum in downtown Middlebury, Vermont. "I'm still having fun," Kimble beamed, as he reflected on his career. Kimble, a New Jersey native, has lived in Vermont for nearly 50 years, working as both an artist and, formerly, as a college art teacher. For decades, he's been one of Vermont's busiest and most commercially successful artists. "And people say, 'You're 80?'" Kimble said, laughing. "I say, 'Yeah, I'm 80, but it's a number.' I'm still experimenting. I'm still finding new ways to do art." Kimble's cows, barns, and other folk works have graced calendars, dinnerware, wallpaper and more around the world. Now, original Warren Kimbles, starting with a simple painting from when he was 13, are on view in the Henry Sheldon Museum show, entitled "Warren Kimble, All-American Artist: An Eclectic Retrospective." "He's a very talented artist who never stops learning and never stops having ideas," said Bill Brooks, the curator of the exhibit and executive director of the Henry Sheldon Museum. 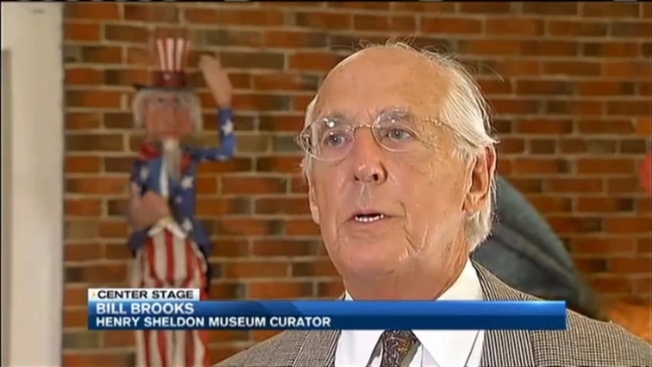 Brooks said he bets visitors familiar with Kimble's folk works will be surprised by what else they'll see here: other styles of painting, other techniques, and sculptures, too. Included in the work is one of the works from Kimble's Widows of War series; a dress form mannequin whose skirt is sharp barbed wire. That series looked at the pain deaths of service members in Iraq and Afghanistan left on the homefront, Kimble explained. Kimble's latest projects are assemblages of old tools and antiques, he said in a tour of the exhibit for necn. "I'm having a ball with that," the Brandon resident said. This chronicle of a career is on view at the Henry Sheldon Museum through October 18. As for whether the artist has a favorite piece, he said, "I always say, 'The next one: these have already be done!’"
It's obvious there's still a lot more to come from Warren Kimble. You can meet the artist and ask him questions yourself at two events before the exhibition closes. Kimble is holding gallery talks at the museum on Wednesday, September 23 and Wednesday, October 7. For more on the Henry Sheldon Museum, visit this website. Click here for more on the Kimble exhibit.